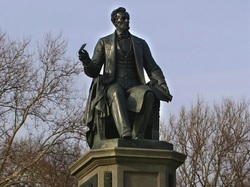 President Abraham Lincoln is best remembered as "The Great Emancipator" and his signing of the Emancipation Proclamation is boldly memorialized with this statue in Philadelphia. While it is true that Lincoln hated slavery as an institution, he recognized that it was protected by Constitutional property rights. Lincoln was not an abolitionist. Although today we consider their perspective the most morally sound, abolitionists were considered extreme during the years leading up to and during the Civil War. Lincoln was moderate, which is why it is important for us to study and understand his journey to freeing the slaves through his own words. Your teacher will assign you to one of 8 small groups and each group will be assigned one of the documents you see on the right. Your group will read the document assigned to you and complete the 'Written Document Analysis Sheet'. In addition to completing the analysis sheet, answer these questions: According to this document, what was Lincoln's opinion on slavery? Was this an opinion he made public, or was it meant to be private? After about 15-20 minutes, all groups will share their document analysis information. You will take notes on the information shared by the other groups using the 'Note Taking Sheet for Other Groups' Documents'. Use this in your small group to analyze your assigned document. Use this sheet to take notes as other small groups present information on their assigned documents. You MUST print your final timeline and bring it into class tomorrow to be checked as homework. Hint: The timeline creator only works properly if you enter the documents in chronological order. When you get to this screen, give your timeline a title and enter your name. Then click 'Next Entry' at the top of the screen to start creating your timeline. We will use the following questions to guide a class discussion after you have completed and turned in your timeline. Was there a difference in Lincoln's public and private opinions of slavery? What words did he use in private letters that he didn't use in public documents to describe his feelings or opinions of slavery? Was there a difference in Lincoln's opinion of slavery between the early public documents and the later public documents? Did he seem to be more or less willing to publicly declare his true feelings? Which documents helped you come to this conclusion?